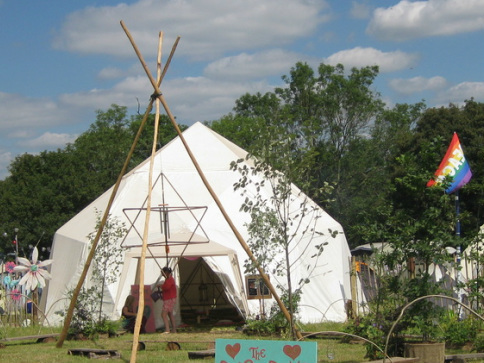 At Geolite Structures we hire and erect Geodesic domes for Festivals, Events and Weddings. We can produce single domes or multiple dome complexes that are ideal for events and parties. Our domes have a white covering, creating a transluscent lightness during the day, while at night becoming the perfect medium for projected lighting. The domes geodesic design gives a fascinating and pleasing effect, while giving a complete clear span space inside. With over 20 years experience in entertainment engineering, we can help make your event a success. Our friendly, trained, family team will safely take care of all construction work. For the past 12 years, we have successfully supplied domes to Glastonbury festival as well as many other well known festivals. All work is carried out to current health and safety guidelines and MUTA codes of practise. We can supply a range of lighting products to give your event that Wow factor, from chandaliers to LED lighting and outdoor floodlighting. Our largest 10 metre diameter dome is ideal for parties and has the facility to add smaller domes joined to it to create the perfect party space with annexes for bar, DJ etc.